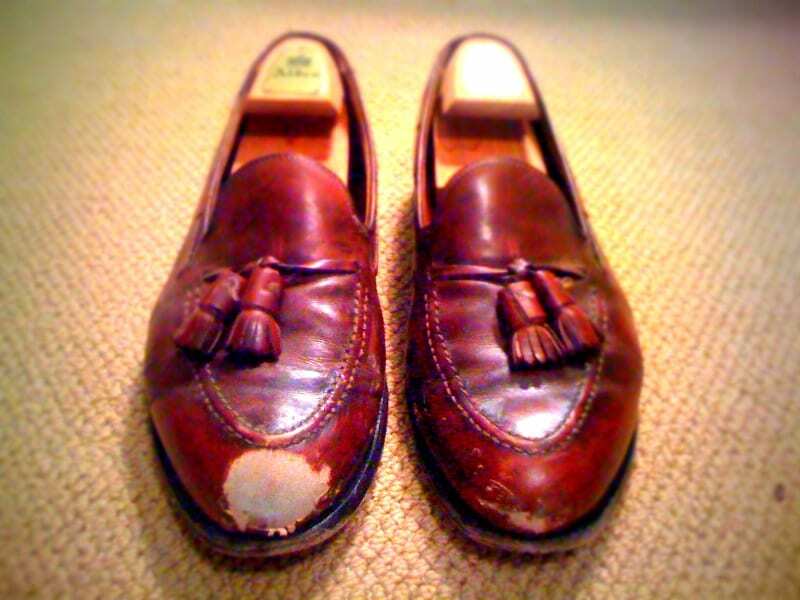 At a wedding recently, I got a little too Footloose on the dance floor and tore up the toe of my favorite shoes, an ancient pair of Original Tassel Mocs from Alden, yes, the same pair I recently had restored. Besides the pending lawsuit in people’s court against one Mr. Kenneth Clark Loggins for damages done by his righteous grooves, foremost in my mind is repairing these bad boys. What, if anything, can be done? Unfortunately, I have no idea about repairs. But inquiring readers want to know — was it Footloose or I’m Alright (theme from Caddyshack) that got them? Whoa! You were getting down for sure. If you figure out how to get them fixed I’d be curious to know… for future reference in case my dance skills ever get on your level. Wow, that is pretty intense. I’d see about sending a photo to Alden and asking what they think can be done. When you told me about them, i didn’t think that they were this destroyed. I know how you love your tassels ever so much and I’m sure there is someone out there who will know what to do. Unfortunately, I don’t have the answer. You need to bring them to our shoe repairer in the land of “Italian shoe Making” The marche and he will make them all new for you overnight! So we don’t repeat this unfortunate situation, how on earth did you scrape the toe box up so badly and remove the leather all together? the repairability depends on the leather of the upper. if its cordovan, there is no big problem in refinishing it with special shoecream and a special bone to rub in the cream. that is, because cordovan (horse) leather is used with the flesh side out. if they’re made of calf leather, you can try to do the same, but it will be more difficult and the grain of the leather wont be restored to its former beauty…. i am afraid your aldens are not made of cordovan, because it looks like the grain is grinded off. some frazzles are still visible, this would not be the case with cordovan…..and make sure to use a cream or wax with much pigment, so you stain the lighter leather underneath the grain. I had the same thing happen to a pair of Allen Edmonds Park Avenues a while back, although not nearly on the same scale. My cobbler used wax to build-up the damaged area, and liberally applied polish, cream, and more polish. It came out fine. Unfortunately, my shoes were black, not a brown-derivative, so patina was not much of an issue. Well, if HRH The Prince of Wales could do this (http://putthison.com/post/1059991080/hrh-prince-charles-shoes-having-been-patched), then I’m sure something could be done for you. Unless Prince Charles wears shoes made out of magic. C’mon son,you know what you have to do……can’t save everybody! Did you see this article on Alden restoration? Jay, I wrote an article on my Alden repair.